Apple Cider Vinegar: Healthy or Hype? All kinds of amazing health benefits have been attributed to regular consumption of apple cider vinegar, from blood sugar regulation to acne treatment to cancer prevention. Is there any merit to these claims, or are they merely anecdotal folk remedies? Does a (shot of) apple (cider vinegar) a day really keep the doctor away? Let’s dig in and find out! First things first, what is apple cider vinegar? 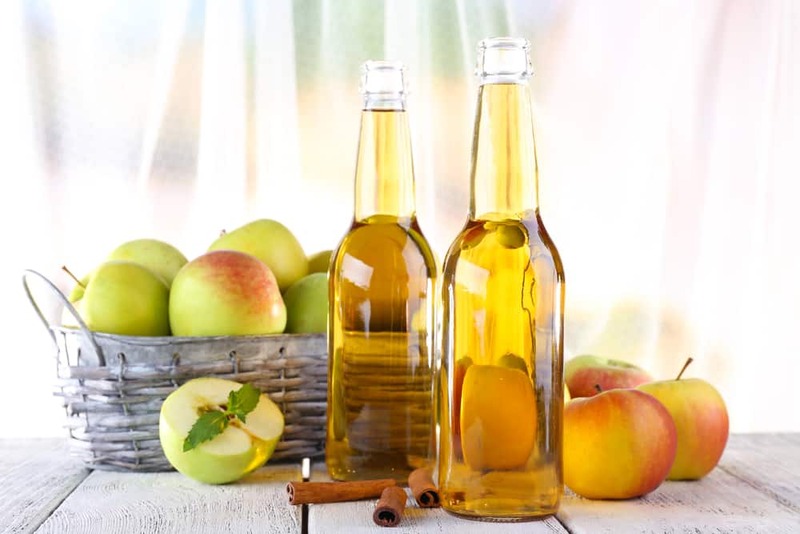 To put it simply, it’s made by crushing apples to extract the liquid, adding bacteria and yeast to kickstart an alcoholic fermentation, and then in a secondary fermentation, acetic-acid forming bacteria converts the alcohol to vinegar. This is pretty much the process for producing any vinegar, whether from apples, rice, grapes, malt, etc. The apple cider vinegar with all sorts of health claims associated with it is typically natural, murky, unfiltered vinegar containing “the mother” of vinegar. The mother consists of strands of proteins, enzymes, and friendly bacteria, which some people believe are responsible for most of the health benefits, but there is no scientific evidence to support this claim. The mother is not unique to apple cider vinegar; it is part of any vinegar, though is typically filtered out of most commercial vinegars for aesthetic reasons. Although anecdotal/folk remedies all point to unfiltered apple cider vinegar, the truth is that all vinegars contain the same active ingredient – acetic acid – no matter whether they’re organic, contain the mother, or what the base is. In fact, much of the hard science regarding the health benefits of vinegar has been tested out on non-apple cider varietals. This means if you want to use a vinegar supplement, you can feel free to choose one you prefer the taste of. So what health claims regarding vinegar consumption are actually backed by scientific evidence? Quite a few of them, actually (though there are equally many that are not). Consumption of vinegar has proven to be helpful in blood sugar regulation and stabilization. There are two mechanisms by which this occurs. First, acetic acid, when consumed before a meal, helps to slow the uptake of sugar into your blood stream. Second, acetic acid interferes with enzymes in your stomach that are responsible for breaking down starch, which means you don’t absorb the sugars from carbohydrates in your meal. But, before you go chugging a glass of vinegar and downing an entire pizza, be aware that although these carbs aren’t broken down in the stomach, it’s entirely possible that they may be fermented and absorbed further down your digestive tract. Furthermore, although there is sound research demonstrating that carbohydrate absorption is blocked, no research has been done to confirm just how far reaching this effect is. That is to say, it could well be that the vinegar interferes with absorption of only a small fraction of the calories from your meal. Because of this blood sugar regulation, moderate vinegar consumption may be helpful in the treatment of type 2 diabetes. There is good evidence to suggest that consuming a small amount of vinegar before a meal will help keep you feeling full for longer. In a small but robust study, people who consumed vinegar before eating white bread felt more satisfied after the meal than those who did not. It should be noted, however, that after a couple of hours had passed both groups were equally hungry again. Animal studies show positive results when it comes to reducing some of the risk factors that lead to cardiovascular disease. One study showed an association between vinegar consumption and reduced blood pressure in rats, and another pointed towards lowered blood cholesterol levels. We need to keep in mind, though, that rats are not people, and the only relevant studies conducted with human subjects have been observational (which don’t prove anything) in nature. Having said that, there’s certainly no reason to expect that similar results wouldn’t occur in human subjects were the same studies conducted with people. Along the same lines, there have been positive results in studies where vinegar is used to shrink cancer cells or kill tumors, however, these studies have all been conducted on isolated cells in vitro, not on humans or animals. Some folk remedies suggest that consuming vinegar can soothe an upset stomach, and there may be some merit to this claim. Though it may seem counter intuitive, the acetic acid in vinegar can actually help neutralize the acid in your stomach, and may be able to relieve heartburn – but only the type of heartburn triggered by something you ate. If you’ve got stomach ulcers or other sores in your digestive tract, adding vinegar will aggravate the situation. And what about claims about the magical properties of apple cider vinegar that may be just too good to be true? Admittedly, this one is a bit tricky. We’ve already said that apple cider vinegar has been shown to contribute to both blood sugar regulation and satiety, so shouldn’t it also contribute to losing weight? Sure. And in some studies there appears to be a correlation between vinegar consumption and reduction in body mass. But we need to keep in mind that these studies are with small subject groups over short periods of time (12 weeks) and that fat loss is a much, much more complex process than simply adding a supplement to one’s diet. We’ve spoken before about detox claims and how our bodies have a complex system in place (including our skin, lymphatic system, gastrointestinal system, kidneys, and liver) to defend against and remove unwanted substances. That system doesn’t need apple cider vinegar (or anything else!) to help it out. Some folks claim that the antibacterial properties in vinegar can be useful in the treatment of acne and some skin disorders. The general consensus in the scientific community seems to be that the acid in vinegar would in fact irritate, rather than soothe the skin. Same goes for those who recommend treating a sunburn with vinegar – youch! So, is apple cider vinegar healthy or hype? Probably a bit of both. At the very least, normal consumption (the most common consumption seems to be 1-2 tablespoons diluted in water) doesn’t appear to be harmful, so if you want to try it out, then go for it. Excessively large doses are associated with decreased potassium levels, which may become life threatening. If you’re taking medications such as diuretics, laxatives, blood pressure medication, or anything really, speak to your health care provider about whether vinegar consumption is recommended for you. There has been very specific research reported on ACV comparing it successfully with 500 mg of Metformin and diabetes control. It was done at Arizona State University and reported in Diabetes Care. It found both reduced blood sugars and weight loss in each of two small studies in response to a high carb breakfast of orange juice and a bagel and a longer study of 2 pounds weight loss and 4 pounds weight loss. So you might want to look those up. Wow amazing info! Have heard a lot about apple cider vinegar but wasn’t aware that apple cider vinegar have so many benefits for health. Found something different and great in this post. Thanks.